The Pug has a square, stubby and compact body..."a big dog in a small package". It has deep wrinkles on its forehead and a soft, open, distinctive expression. The Pug dog will communicate with people by making nasal noises. This affectionate dog breed makes an excellent family pet. Male Pugs range from 12 inches to 14 inches. Female Pugs range from 10 inches to 12 inches. Male Pugs range from 13 to 20 pounds. Female Pugs range from 13 to 18 pounds. Pug colors are typically silver, apricot-fawn or black, with clearly-defined black markings on the face. Pugs have soft and smooth coats. Relatively easy to maintain with some shedding, Pugs require brushing only once or twice a week. Playful and happy, dignified and funny, Pugs do well with visitors, children and other pets. Although sometimes stubborn, the Pug is more typically pleasant and anxious to please. A show-off. 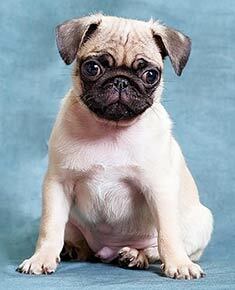 The Pug is susceptible to patellar luxation, epilepsy and skin problems. The expected life span of the Pug is 12-15 years. Pugs are a less active breed and require minimal exercise to stay happy. An excellent apartment dog, a walk each day will provide ample exercise for this lovable breed. The Pug is in the toy group. The pug is that little wrinkly faced bundle of energy named after the Old English word for a playful little devil. He may look stern, but the pug is very playful and loads of fun. The stocky body of a pug resembles that of a Bulldog, although the adult pug weighs only 15 – 30 pounds. Their dark, prominent, expressive eyes look out over a short, flat muzzle. Pugs may be fawn, black, apricot, or silver, but typically have only black or fawn around the muzzle. The mouth shows a bit of an under-bite, although not as much so as the Bulldog. One of the most distinctive features of the pug is its curly-cue tail, which ranges anywhere from a half-curl to a full double curl. The tail should be tightly coiled, and preference is given in the breed standard for the full double curl. The ears are somewhat a matter of controversy. Although they are always black and velvety, they may be shaped like a rose or a button, with a breeding preference toward the button variety. Rose-shaped ears are small, round, and folded such that the front edge angles towards the mask, giving the head a rounder shape. Button ears are those that are level with the top of the forehead. These ears fold at a sharp 90-degree angle. If you are looking for a dog that doesn’t shed, the pug is definitely NOT for you. Shedding is one of the things they do best! Partial control of shedding is possible by altering the dog’s diet, grooming him regularly, or trimming the coat. None of these methods is particularly foolproof, and you will likely spend a good bit of time grooming and vacuuming if you adopt a pug. However, if you are looking for a fun dog, you may be willing to put up with the fur around your house. This breed is playful, charming, and clever. They are very sociable and generally prefer human companionship to that of dogs or other pets. If you wish to live with a pug, you should be prepared for the fact that they are often underfoot, following you from room to room. This is one of those dogs that thinks he has to help you walk down the steps and suspects you are leaving forever when you shut the bathroom door. Pugs are entertaining but can be hard to train, so start when they're young. The pug is great with kids, as youngsters are just the right size; however, the pug does not do well outdoors on hot days, so he should be an indoor companion for your children. If you are looking for a watch dog, forget the pug. He will never meet a stranger in his whole life. 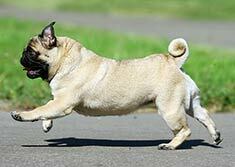 The breed is also not known for being easy to train, although there are pugs who perform well in obedience trials. It takes a lot of patience and practice to train the stubborn pug! According to a survey of pugs.com visitors, only about a third of pug owners were confident in their dog’s housetraining. Another third said their dog was housebroken “most” of the time. Some of the distinctive features of a pug cause the breed to be more susceptible to illness and injury than other breeds. For example, the deep brow wrinkles require special care, making sure to keep the valley areas between the folds clean and dry. Failure to do so can result in irritation and infection. The short snout fails to protect the dog’s eyes from puncture wounds and scratched corneas when he bends down to examine the cool things he finds on the ground. Without proper care, a scratched cornea can quickly turn into a corneal ulceration or even a ruptured eye. If your pug’s eye seems red or weepy, consult your vet right away to keep the condition from worsening. As with all short-snouted dogs, the pug is prone to getting food stuck above his soft palate, leading to a sound that resembles reverse sneezing. These attacks are not particularly harmful to the dog and can usually be resolved by calming the dog and gently massaging his throat to make him swallow the food debris. Perhaps more importantly, the short snout means that the pug has a hard time cooling himself because he can’t evaporate as much moisture off of his tongue. Evaporation from the tongues of dogs is analogous to human sweating, where the air evaporates the moisture, leaving the important organ structures cooler inside the body. 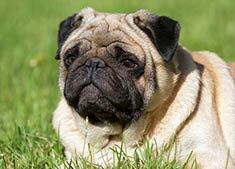 The pug originated in China, where he was a lap dog to the Chinese rulers of 1600 – 1046 BC. The breed soon spread to Tibet, where pugs were raised by monks. Pug dogs were then exported to Japan and from there to the European continent. In Italy, they were dressed in matching jackets and pantaloons, serving with coachmen to the rich. In France, Marie Antoinette had a pug named Mops, and Josephine, the wife of Napoleon Bonaparte was partial to the breed. No wonder! The dog was the only family member allowed to visit Josephine while she was imprisoned, and she used him to smuggle messages in and out of her cell. In England, Queen Victoria’s love of pugs is credited with leading to the formation of the Kennel Club in 1873. In more recent times, the pug has been featured in the animé series Naruto and on the drama series The West Wing, where a pug played President Walken’s (John Goodman) dog. The pug is also a favorite in Hollywood, having performed in Milo and Otis, Homeward Bound, Pocahontas, and Men in Black. One of the designer dogs becoming ever more popular is the puggle – a cross between the pug and the beagle. Although the puggle is just adorable, consider the fact that you are mixing a scent hound who needs every inch of his nose to track, with a dog that barely even has a nose. In addition, both dogs are notoriously stubborn and hard to train. Perhaps crossing the two is not the best idea ever hatched. So, the pug has many good points including its playfulness, fun-loving spirit and wonderful ability to provide companionship. However, there is a downside, including abundant shedding and a stubborn streak that makes them hard to train. But you just can’t beat their upbeat personality and clownish behavior to keep you happy every day! Find Pug Puppies with our Free Breeder search!